Attention to all shoppers: Please be aware orders wont be dispatched until Wednesday 24th April 2019 due to the Bank Holiday. 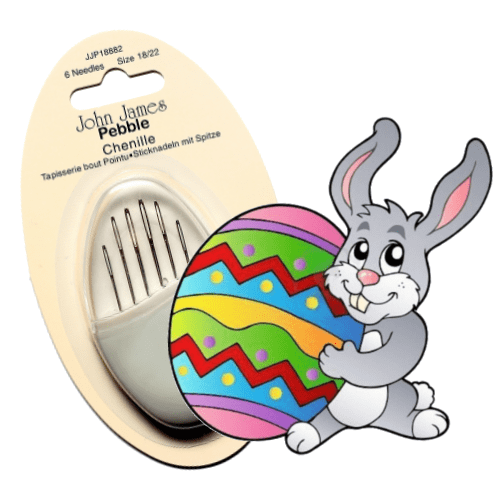 Happy Easter from the John James team ! This misty grey coloured pebble contains size 18 to size 22 chenille hand sewing needles with large threading eyes and sharp points. Contains 6 hand sewing needles. FREE Standard UK Delivery* on orders over £15. £1.30 Standard UK Delivery* on orders up to £5. £2.00 Standard UK Delivery* on orders up to £10. £2.60 Standard UK Delivery* on orders up to £15. Next Working Day delivery to UK mainland destinations available. Entaco is a registered trademark. This website and all images and designs are the copyright of Entaco. Copyright © 2019 JJ Needles. All Rights Reserved.